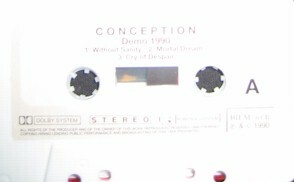 Conception was founded in Raufoss, Norway November 1989 by guitarist Tore Østby, with Dag Østby (vocals) and Werner Skogli (drums). A couple of weeks later Tore brought in his music-schoolmate and bassplayer Freddy Samsonstuen, and the band started to work towards their first demotape. In April 1990 they hired a studio for one day, and put out a 3 track demo. But as their ambitions grew, the line-up had to be changed. In June same year after only playing one show with the band, Werner had to leave, with Arve Heimdal stepping in. Arve was known to the local music scene from several rock bands. They went back into studio after a few weeks with Arve, and did their second demo, consisting of ten tracks. This was the last thing Freddy did with the band, and Conception hooked up with bassplayer Ingar Amlien in early autumn. The band did now feel the time was right to do a real studio recording and release a CD/LP. Instead of shopping for a record deal, they founded their own label, CSF Records, and started planning their first release. 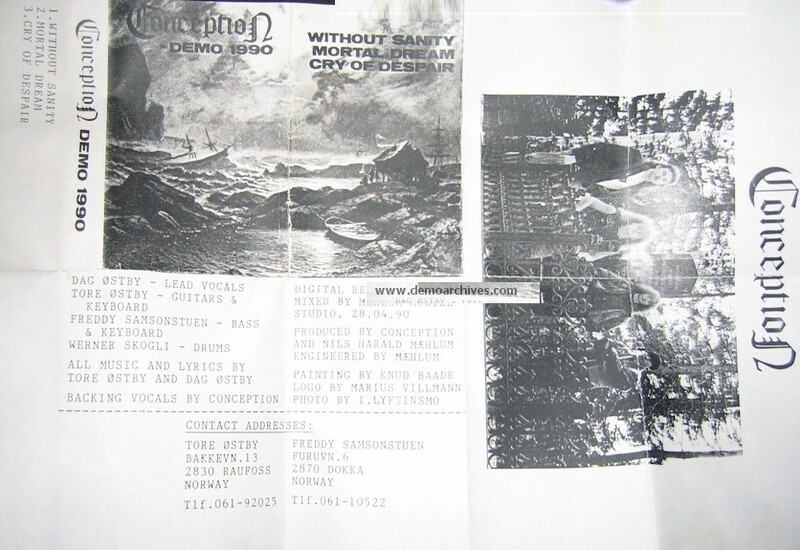 After some months of hard rehearsing, songwriting and some shows, Conception went in Gjövik Lydstudio with co-producer and engineer Nils Harald Maehlum, February 91, to record a four track EP. But the band had to face another problem. The sound of the band had been radically changed from trash metal into a melodic, progressive style. Dag´s vocal style did not really fit the new song material, and the search for a new singer began. After auditioning singers from all over Norway, they finally met up with Roy S. Khantatat in June. One month of rehearsals later, Conception went back in the same studio with Maehlum to do the full length album "The Last Sunset". The album took about one month to record, with studio musicians Hans Christian Gjestvang and Staffan William-Olsson taking care of keyboards. Finally the band had the right line-up and a first album, -this felt very much like the real beginning. First demo with Xeroxed covers. Cover folded out to A4 size. Nice studio tapes with stickers printed. Second Demo with Pro printed covers. Nice studio tapes with stickers printed..